Man Setting Clock, a Norman Rockwell painting, appeared on the cover of The Saturday Evening Post published November 3, 1945. This is another favorite of Rockwell collectors, a classic enduring image of the world Rockwell painted. An alternate title for this painting is Clock Repairman. This painting was Rockwell's 233rd overall out of 322 total paintings that were published on the cover of the Saturday Evening Post. Rockwell's career with the Post spanned 47 years, from his first cover illustration, Boy With Baby Carriage in 1916 to his last, Portrait of John F. Kennedy, in 1963. This was also the seventh cover for The Post in 1945. In 1945, there were ten Norman Rockwell Saturday Evening Post covers published. In this painting, Norman Rockwell takes us to a man working in the city. 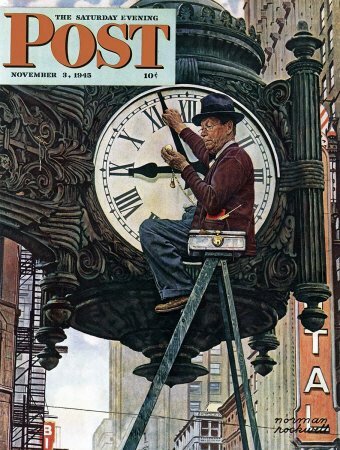 Of course, as you can see, Rockwell only shows the endpoint of the man's job, setting a giant clock. Thee scene takes place in Chicago. The clock is one of a pair of 7&3/4 ton bronze timepieces on the famous Marshall Field & Co deparrtment store, located on the Loop. The clocks are electric and are controlled by a central clock that corrects them every half hour. The only time the clocks need resetting is after a power failure. Surely there is more to the man's job than merely climbing a ladder and moving the clock's hands to match his own pocket watch. Surely his tool chest, sitting beside him on the ladder, is not there just for looks. Notice that he uses his own pocketwatch to set the time. Man Setting Clock was only one of 322 Norman Rockwell Saturday Evening Post covers; Here is the list of Norman Rockwell Saturday Evening Post cover illustrations. No doubt Rockwell was visiting in the city once and saw a scene just like this. Rockwell's talent, aside from his incredible painting talent, was that he could take a mundane scene and make it interesting, amusing and even funny. Take, for instance, all the detail on the clock and in the surrounding city. Notice the bird nest in the scrollwork? What do you find amusing in this painting? Do You Have A Great Story, Opinion Or Contribution About Man Setting Clock?